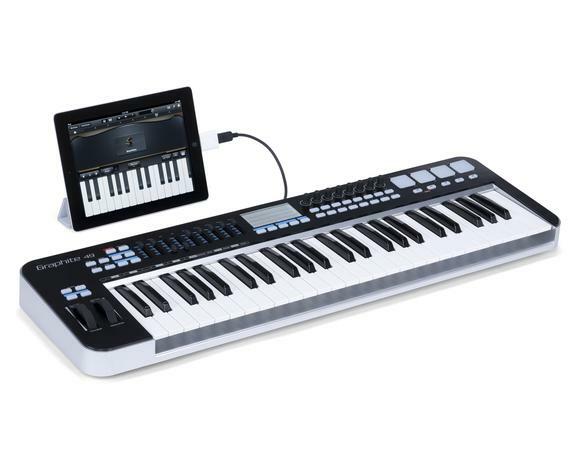 The Graphite 49’s semi-weighted keyboard provides musicians with a responsive and expressive platform that is designed to feel more like an instrument than a controller. It comes equipped with velocity-sensitive keys that accurately capture the dynamics of a performance. 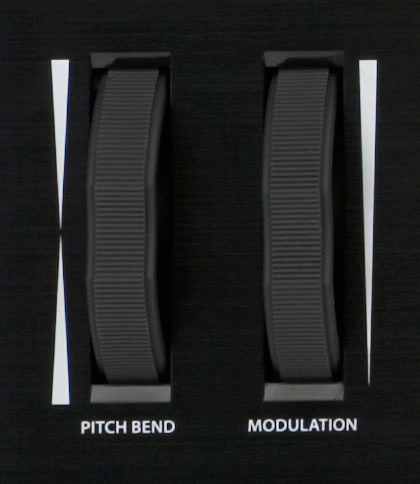 Aftertouch offers customizable control over a variety of effects and parameters, for example the addition of growl to a saxophone or vibrato to strings. 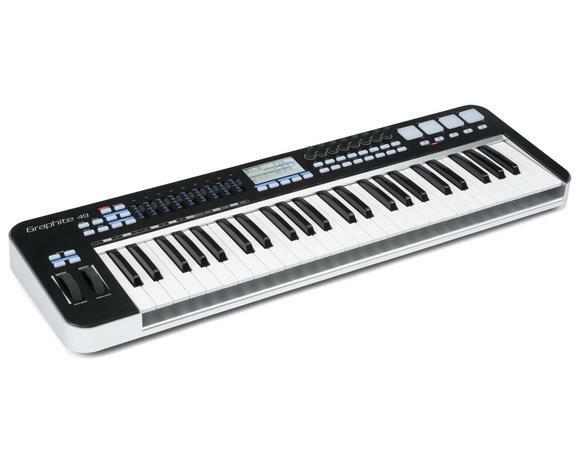 With 49 keys, the Graphite 49’s pitch range is perfect for performing, while remaining highly portable. Take full control of your DAW and virtual instruments with the Graphite 49’s controller functions. 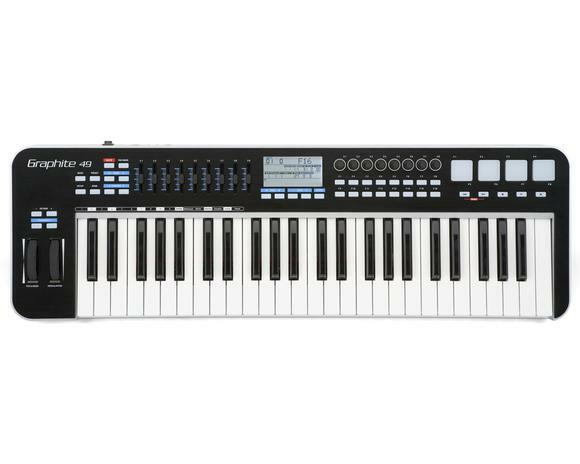 It features 9 faders, 8 encoders and 16 buttons, all customizable for the ultimate in hands-on control. Not only are they customizable, they can be programmed on-the-fly without the need for editor software. The Graphite 49’s large LCD screen displays the behavior of every function in real-time, enabling intuitive mapping with any software you’re using. With a compact body design that is thinner than most controllers in its class, the Graphite 49 is perfect for live performance and studio applications. It’s constructed for optimal playability whether it’s placed on a solid surface or mounted to a keyboard stand. And its sleek, angled top panel offers easy viewing in any environment. 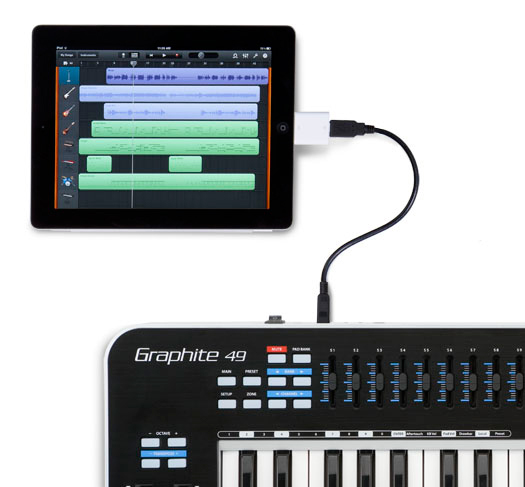 When combined with the iPad using Apple’s iPad Camera Connection Kit or Lightning to USB Camera Adapter, the Graphite 49 is a great tool for making music on-the-go. Use it with your favorite music and synth iPad apps that support MIDI controllers. For additional mobility, the Graphite 49 can be powered directly by the iPad when you are away from your desktop computer. Bundled with the Graphite 49, Native Instrument’s Komplete Elements 8 software offers a comprehensive selection of studio-quality sounds, effects and tools for modern music production, composition and sound design. With over 3GB of samples, Komplete provides you with more than 1,000 premium sounds and 3 mighty player engines – all carefully compiled to provide a strong toolkit for both stage and studio. It’s a ready-to-roll professional software package for all production styles.